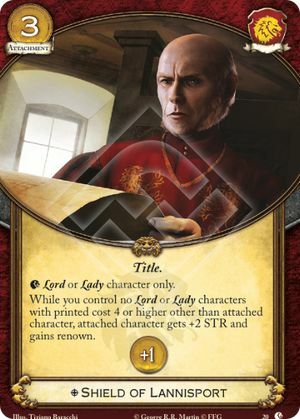 While you control no Lord or Lady characters with printed cost 4 or higher other than attached character, attached character gets +2 STR and gains renown. Lions of Casterly Rock #20. There is mistake in description. "(...)with printed cost 4 other than(...)" should be "(...) with printed cost 4 or higher other than(...)"